The next stop on The Cravings Queen’s Kansas City Barbecue Tour came after Christmas Day. Following a day of eating classic holiday food I was ready to indulge in more of Kansas City’s famed barbecue. Initially, we set our sights on lunch at Danny Edwards Blvd BBQ in downtown Kansas City, Missouri. When we arrived, we were dismayed to see the gates of the restaurant closed. I didn’t see anything on their website about a December 26 closure so I felt betrayed. I quickly pulled up my curated list of barbecue restaurants and saw that Danny Edwards was less than five miles away from another Kansas City classic barbecue joint, Arthur Bryant’s. Arthur Bryant’s has two locations in Kansas City, Kansas and Missouri. We ate at the original location that has received visits from notable figures, including Steven Spielberg, Barack Obama and several other presidents and celebrities. Their visits are properly documented and displayed on the walls of the restaurant when you first walk in. The restaurant’s downtown location is as casual and unpretentious as they come. We got in line and began browsing the wide menu. Arthur Bryant’s is best known for their slow-smoked brisket and ribs as well as their “world famous” burnt ends. With a designation like that, I couldn’t pass them up, so I ordered the open-face burnt ends sandwich. My mom and dad ordered the brisket sandwich and sausage sandwich, respectively. All sandwiches are served on untoasted white bread. As you order and wait in the cafeteria-style line, you can watch as the cooks slice the brisket, ham, turkey and more, then pile the meats high. Arthur Bryant’s is a bit pricier than other barbecue restaurants in Kansas City but, with the amount of meat you get, you’ll have enough food for not one but two meals. Once we were seated, we wasted no time diving into our food. Arthur Bryant’s notes that all sandwiches and meat trays are served the “old school” way, without sauce. The only exception to this rule is the burnt ends, which are slathered in Arthur Bryant’s signature barbecue sauce. Apparently, Arthur Bryant’s used to give away the burnt ends of the brisket for free. Today, people come from all over the country to try this signature offering. Instead of serving the burnt ends in cubes, like most barbecue restaurants, the ones at Arthur Bryant’s come slightly pulled in a sweet barbecue sauce. Given the uniqueness of Arthur Bryant’s tender burnt ends, I can see why they are a favorite among so many. My mom’s brisket sandwich came with such a generous portion of brisket that she didn’t even know where to begin eating it. The same could be said about my dad’s sausage sandwich. When I looked at his tray, I didn’t believe that it was actually sausage. I am typically not a fan of sausage but I definitely enjoyed Arthur Bryant’s. The sausage comes in a large roll and is sliced deli-style. The one-of-a-kind sausage wasn’t too spicy and I certainly preferred it over sausage links or patties. Since my parents’ sandwiches didn’t come with sauce, they chose from the three available on the table, Original, Rich & Spicy and Sweet Heat. The Rich & Spicy was sweeter than the original but had a smoky flavor to it. The Sweet Heat begins with a mild heat but kicks up after a few seconds. Use with caution. To go with our barbecue sandwiches, we also split orders of onion rings. Arthur Bryant’s onion rings are hand battered and fried. They reminded me a lot of my grandpa’s homemade onion rings. As soon as we drove by Arthur Bryant’s and got a glimpse inside the restaurant windows, we realized that this is a hot spot for locals. While the restaurant has been mentioned in countless food publications, attracting tourists to its doors, Arthur Bryant’s doesn’t offer up any frills to wow tourists other than fantastic food. The cooks behind the window get your order and want you to keep it moving. The efficiency is one of the reasons why the restaurant is so popular. Yes, Arthur Bryant’s is a sit-down establishment, but if you want something, you better get it yourself. 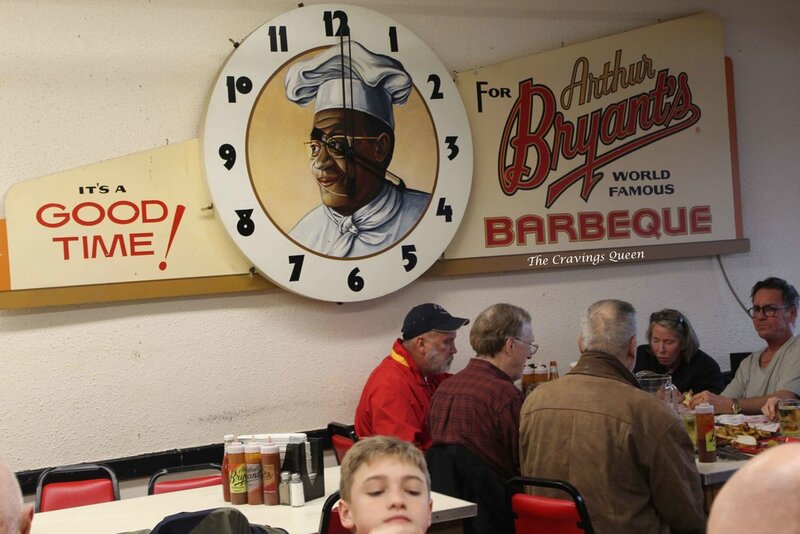 Arthur Bryant’s legacy of serving phenomenal barbecue still remains today. When visiting Kansas City, this famous barbecue eatery is not to be missed. Arthur Bryant’s is located at 1727 Brooklyn Ave., Kansas City, Mo. and 1702 Village West Parkway, Kansas City, Kan.